After years of development we have realized QASS µmagnetic, a completely new micromagnetic measuring concept. We utilize the Barkhausen noise, that is known for decades, which means ongoing interaction ferromagnetic materials by using an external magnetic field. This is combined with very high sampling rates and our real-time spectral analysis. Determine the hardness of your purchased materials and conduct a reliable Positive Material Identification. 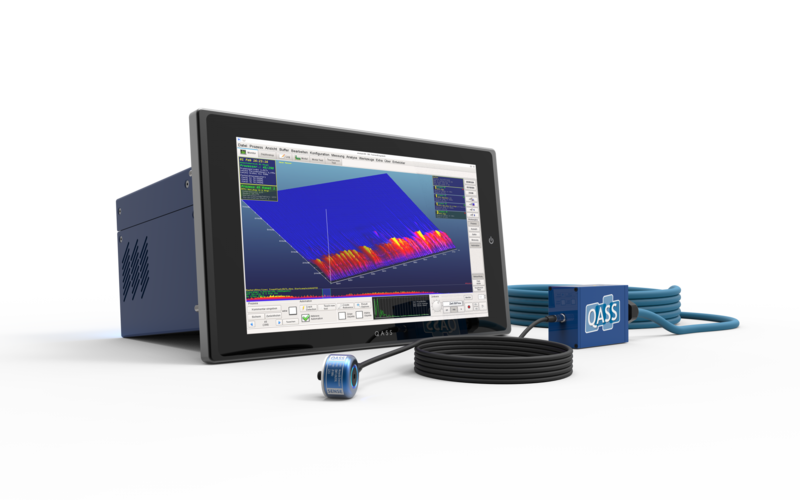 Analyse non-destructively the hardness condition of ferromagnetic components and materials with QASS µmagnetic. Due to the one-time calibration of the QASS µmagnetic to your materials, a reference condition is set whereby the hardness can be shown in Rockwell, Brinell or Vickers. QASS µmagnetic measures via direct contact or even with an air gap between sensor and component. The QASS software compensates known distances, which could influence measuring values. Thereby we are able to detect the hardness of ferro-magnetic materials even under noisy and unsettled conditions. 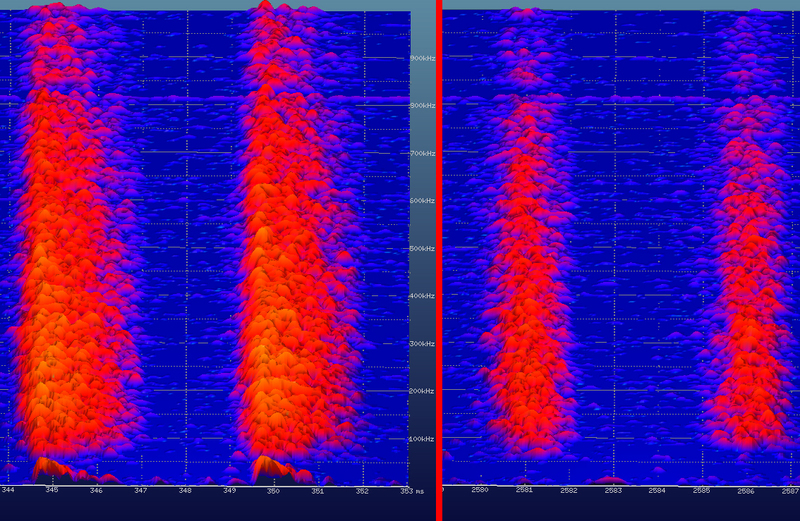 The detailed analysis is shown in a transparent 3D-landscape with the axes frequency, time and amplitude. The numbered result is user-friendly visualized as a single value. The measurement system enables a contact-less hardness measurement in real-time, directly on the component and under production conditions. A measurement on parts that move during production is possible, for example, when rotations or linear movements are used. 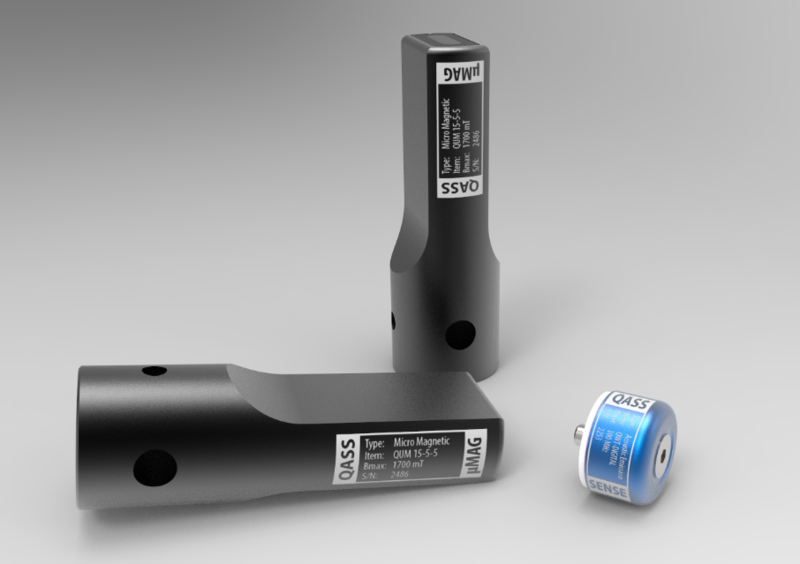 The new sensors by QASS can be customized to the customer’s needs and processes. Contact us – we will find a solution. The QASS µmagnetic system is based on the successful Optimizer4D. Different mechanical parameters correlate with different signal amplitudes. This 3D-depiction of QASS µmagnetic shows the reversal of magnetism and its micromagnetic response. High amplitudes correlate with quick changes of orientation of the inner magnetic field. The faster the changes, the softer the material and the higher the signal amplitudes – similar to a micro magneticfinger print. The left depiction shows soft material with higher amplitudes. On the right there are lower amplitudes that show a higher hardness value. Different hardness means different signal amplitudes. QASS µmagnetic makes the material properties visible in real-time. Hardness values can be read from the data after in-depth calibration. The user has the option to adjust the tolerance thresholds in the Analyzer4D-software by himself. This is shown as a determined hardness value on the measurement system. As soon as this value is undercut or exceeded, the material is assessed as faulty. QASS µmagnetic is able to process millions of sensor samples per second, with the help of advanced big data algorithms and the QASS spectral analysis – all in real-time. Cognitive measurement means understanding: Adapted to your process, the system recognizes on its own when the production exceeds tolerance thresholds. When a threshold is exceeded a signal lamp can light up, or the system immediately sends a signal to the machine. The system can easily be retrofitted into existing production chains. Measure the mechanical parameters of your test specimen. The measurement results are displayed live. All application options of QASS µmagnetic are possible upstream, in-process, and downstream. Test your components and materials non-destructively and contactless. The technical feasibility in a process depends on the available space and process control. Innovationat familiary high quality: the new magnetic field sensors (left and middle) in comparison to a QASS standard sensor (right).